It is now late summer and mimosas cover our small backyard. There are hundreds of these worms hanging from single silk-like threads from high up in the trees all the way to the ground. How do we get rid of them?? Apply BIFEN XTS using a 20 GALLON HOSE END SPRAYER. This active will kill them on contact and it does a great job of penetrating their tents. One thorough treatment can have a huge impact and in theory, could eliminate most if not all of the problem as long as you’re able to reach every bit of each infested tree. But if you can’t reach high enough with the sprayer, expect to do 1-2 more treatments to get them all. This will happen as more “drop down”. Add 1 oz of Bifen XTS to our hose end sprayer and then add water to fill it up to the 5 gallon line (that’s about 1/4 of the way full in the sprayer). 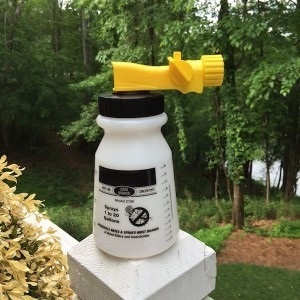 Use this to spray as much of the tree canopy, bark and ground underneath as possible. If you expect to need more spray, you can add 2 oz to the sprayer and fill it half way (to the 10 gallon line). Just be sure to use up what you add to the tank; you don’t want to store the sprayer with chemical inside for any length of time as this will lead to the sprayer getting clogged. Now if you have a good treatment in place the ones that drop down should die within a few days but if need be, retreat weekly until you don’t see any activity.